Shyama, Amrita-krishna and Lakshmi now have another friend to play with, Sharan. 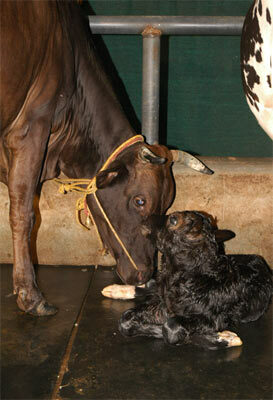 Sharan is a newborn calf. He is a black beauty with white spots around his ankles and across his forehead. He was born this morning, at about 1 a.m. Yesterday evening, Lakshman who works in the cowshed told me that a pregnant cow would give birth soon. “How do you know?” I asked. All the signs are there, he said. He took me to the cowshed. I couldn’t believe what I saw. The cow’s udder was dripping with milk. The cow was already anticipating the birth of its offspring, and the overflowing udders were clearly expressing this anticipation. Seeing it, I was overwhelmed. I realized how great the motherhood is! Tears welled up in my eyes. When I checked three hours later, Lakshmi, the pregnant cow was lying in a pool of milk. It had not given birth yet, but its udders were overflowing. Amazing! Even though I had worked in the cowshed years ago, I had never seen this. Or maybe I never noticed it. When Sharan was born, the first thing its mother did was to give it a ‘lick bath.’ Within 20 minutes, he was trying to stand up and move about. Shanmukhan tied him with a cloth to a post next to its mother. By evening, it was running around in the garden in front of the cowshed. Most of us take cow’s milk in one form or the other: with our tea or coffee, or as cheese or butter. How many of us spare a thought for the mother cow whose milk we imbibe? Amma (Sri Mata Amritanandamayi Devi) reminds us that we have to remember the creator when we enjoy the creation. When I saw the udders dripping with milk, a thought flashed in my mind. Many of us pray for the living. Some even pray for the dead. But how many pray for the unborn? Only a Mother. Swamiji, what beautiful and sublime thoughts..
What a beautifull son…compliments to the mother and to the Divine Mother! what a beautiful thing to say! praying for the unborn :), loved it! What wonderful poetry this is….and what a beautiful little baby! !